Hello lovelies! So, over the past year I've made a promise to myself to try and look after my skin and improve my skincare routine; I mean, up until recently the extent of my routine was to wash my face, moisturise and off I went! 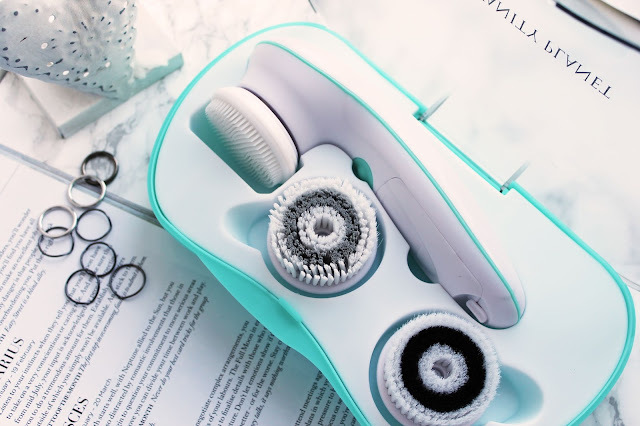 I must admit, my routine isn't drastically different nowadays - but I recently introduced into it the Vanity Planet Ultimate Skin Spa System, and I can honestly say that my skin has never felt so good. And the best thing about it? it comes with not one, but THREE brush heads to choose from! 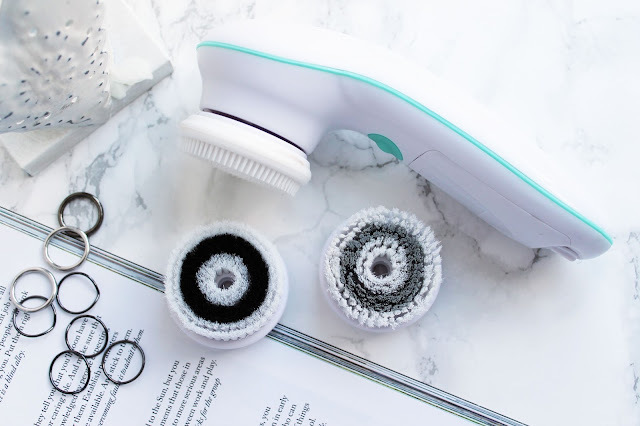 The ultimate skin spa system is a skin cleansing/exfoliating tool which uses micro-massage action to deep clean the skin and lift away all the dirt and grime from your pores! 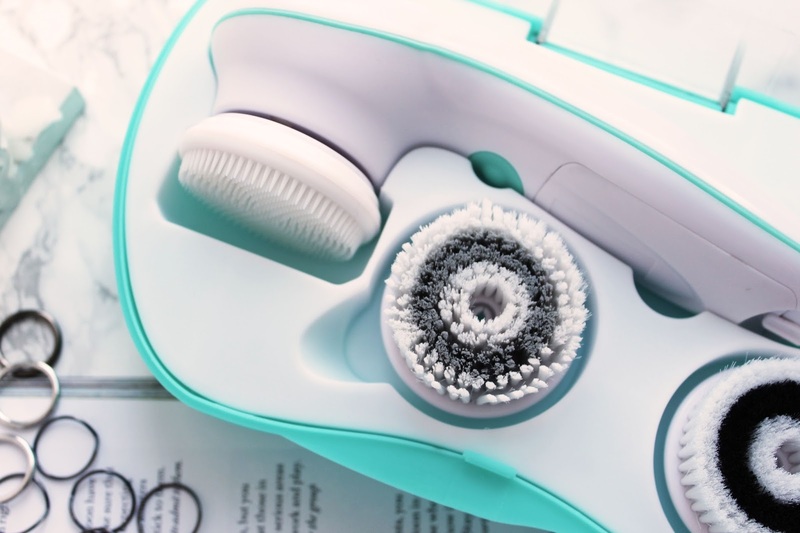 I've been using this device twice a day for nearly two weeks now and already the difference in my skin is incredible; my pores are way smaller, my skin is visibly clearer, smoother and more even. I use it in the morning to wash my face, and I tend to use the daily cleansing brush for this. This brush has longer bristles than the exfoliating brush which means that it is more gentle on the skin which provides for great general cleaning. In the evenings I use the silicone brush head in combination with my clinique cleanser to remove all my makeup, needless to say it gets it all off! About once a week, I use the exfoliating brush head to get rid of any dry skin on my face, and to treat myself to a little at home facial! I really do not know what I'd do without this great little device, it's the perfect easy step to add into your skincare routine yet it makes such a huge difference, my skin looks sooooo radiant and smooth and makeup goes on a treat after using it. I will continue to use this little wonder literally forever, and I can't wait to see what else it does for my skin! The skin spa system retails at $125 but vanity planet are offering 70% OFF using the code 'isabelle', and so you don't have to do the maths (ew maths), that reduces the price right down to $40 - amazing right?! You can buy directly at www.vpwow.com/isabelle/. Great skin for everyone! Thank you for reading this long winded review, but I really do adore this machine and I hope you do too! Great review of this vanity planet product. I use the spin for perfect skin and can vouch that the brushes are amazing. Great review, I use an olay cleansing system like this called the pro-x but it doesn't have the different brush heads which is a shame. I've used it a few times but really need to get into a routine of doing it every day and hopefully I'll see a bigger difference in my skin, just like you have with using yours.